The RYTE tool offers you a wide range of SEO optimizations. One of its components is content optimization. From content reports to competition reports: these insights allow you to get an advantage, so you can stay ahead of your competitors. This article zooms in on the specific content component of the RYTE technology. The ‘content success’ section is one of the 3 pillars RYTE focuses on. The people behind the program pose that you need great content to keep ahead in the current digital landscape. The tool allows you to set up a profitable business by monitoring, analyzing and writing great content, as is promised by its manufacturers. With RYTE you can check if your current content is good enough to beat your competitors. Which content realizes the most valuable traffic and the most conversion? This is presented clearly in the content report of the keyword of your choice. This is also where you can discover which potential keywords you very well could use, within the context of your business. To keep track of your keyword density and compare it with your biggest competitors, RYTE uses their so-called TF*IDF module. TF*IDF is an algorithm and stands for ‘Term Frequency’ x ‘Inverse Document Frequency’. Enter the keyword you want to analyze, choose a language and region and create your TF*IDF report. Subsequently, you get an overview including the top 15 results that use the same keyword next to other keywords that might be interesting. Looking for inspiration? Use ‘text assistance’ to get suggestions for possible terms you can include in your text. This is how you get insight into the words you use too much or too little to emphasize your message. A nice extra option is that you can also use the TF*IDF module for your planned content that you haven’t even published yet! 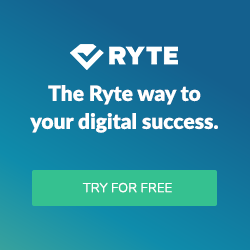 Improve your online visibility and register for free at RYTE to give the tool a go!